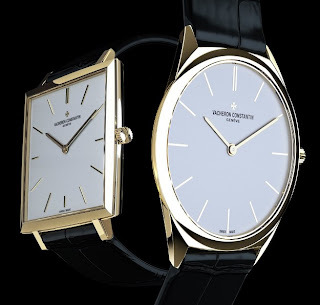 Vacheron Constantin has chosen today to revive some of the finest moments in the quest for ultra-thinness. The brand is enriching its “Historiques” collection with two new creations directly inspired by its heritage, each lending a new and distinctively modern touch to one of two legendary calibres. For Vacheron Constantin, celebrating the 55th anniversary of the birth of the ultra-thin Calibre 1003 provides an opportunity to revisit its heritage. Considered to be one of the most beautiful and refined ultra-thin movements on the market, Calibre 1003 has been defying mechanical laws for over 50 years. It is extremely complex to produce and its adjustment calls upon the full measure of expertise cultivated by a fine watch manufacturer. The decoration is extremely meticulous: Côtes de Genève, bevelling and chamfering, and drawing the steel parts with a file are all performed by hand. This exceptional degree of finishing earns the new version of Calibre 1003 the prestigious Hallmark of Geneva, an independent and sovereign certification awarded by the State of Geneva which thereby guarantees the origin, precision, durability and fine craftsmanship of models from a handful of Geneva-based watch companies. For its 2010 re-edition, Calibre 1003 is presented in a round watch in 4N 18-carat pink gold measuring 36 mm in diameter, inspired by one of the three historical models introduced in 1955, reference 6099. The latter has been selected because of a design that already embodied a decidedly modern touch at the time of its launch. 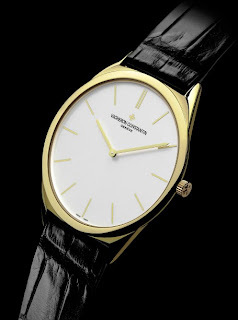 Vacheron Constantin has chosen to make 2010 a tribute year to its ultra-thin timepieces by reissuing, again within its “Historiques” collection, a square-shaped model dating from 1968 and equipped with the famous ultra-thin self-winding Calibre 1120. In revisiting this watch, the Manufacture has adopted an extremely distinctive style: that of the 1960s. This 4N 18-carat rose gold timepiece creates a striking contrast between the strict square dial opening and the slightly curving case flanks. Compared to the original 1968 watch (reference 7614), the watch now presented features updated technical characteristics in tune with modern times: water resistance to 3 bar, equivalent to around 30 metres; a sapphire crystal, and a clipped-down solid case-back exactly like the original model. Despite such improvements, which generally tend to increase bulk, this watch measuring 35.2 mm along its sides is even thinner than its historical predecessor: 5.5 mm compared with 6.52 mm, making it one of the thinnest watches in its category. Like the 1968 model, the contemporary version is equipped with the ultra-thin self-winding Calibre 1120. This exceptional movement driving hour and minute hands has powered some of the most prestigious ultra-thin self-winding watches in horological history. Vacheron Constantin has chosen in 2010 re-issue two ultra-thin watches that have made their mark on its history, duly christened “Historique Ultra-fine 1955” and “Historique Ultra-fine 1968”. The most expensive watch worth US$540,000 Vacheron Constantin Patrimony Minute Repeater Perpetual Calendar, worn by Italian Prime Minister and mega-wealthy industrialist Silvio Berlusconi. This Vacheron Constantin watch is worth over five hundred thousand dollars. 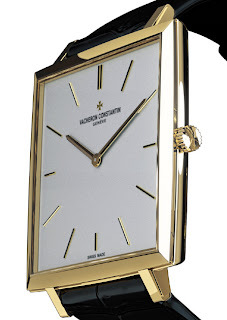 The Vacheron Constantin Patrimony Minute Repeater Perpetual Calendar was produced from 1946 through 2006. The discontinuance was a good strike news to those collectors fortunate enough to own one. 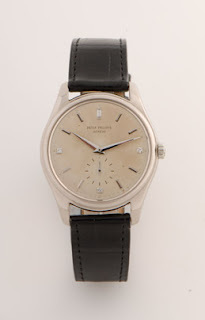 This watch is in platinum, with the Vacheron Constantin reference number 30020/000P/7596. It features a platinum case, with Vacheron’s familiar flared lugs. Its front crystal is a sapphire one while the back crystal one is made of acrylic permitting the repeater tone to sound more purely and louder. 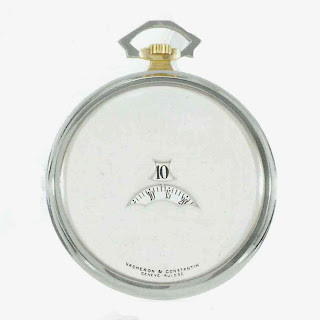 Case dimensions: 37mm diameter by 10.5mm thick. 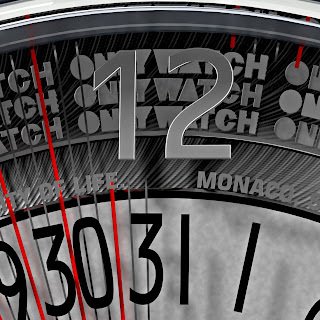 Dial is silver with applied hour markers and sunken subdials. The following calendar information is shown: day, date, month, leap year, moonphase and age of the moon. Its movement: the manual winding Vacheron Constantin Caliber 1755 with 30 jewels and adjusted to five positions and temperature. The construction of this movement and its finishing are extremely beautiful. The repeater hammer and gongs can be seen at work, when the repeater is activated. Silvio Berlusconi was born in September 29th, 1936. He is an Italian politician, the current Prime Minister of Italy as well as a billionaire entrepreneur. He is the longest-serving Prime Minister of Italy, a position he has held on three separate occasions: from 1994 to 1995, from 2001 to 2006 and currently since 2008. He is the leader of the People of Freedom political movement, a centre-right party he founded in 2009. As of November 2009, he is the longest-serving current leader of a G8 country. Born of a determination to highlight the wealth of the Vacheron Constantin heritage, the ‘Historiques’ line is intended to revive models symbolising the spirit and expertise of the brand through contemporary contemporary reinterpretations. After presenting the reinterpreted Chronomètre Royal 1907 on the occasion of its 100th anniversary, in 2008 Vacheron Constantin presented the ‘Historiques American 1921’, a piece inspired by an avant-garde cushion-shaped wristwatch featuring a crown placed at 1 o’clock and confidentially produced for an American client during the Roaring Twenties. In keeping with the spirit of that era, Vacheron Constantin has once again returns to creative roots by combining inventive design with rigorous respect for history in this eloquent tribute to the 1920s. Radiating classic and understated elegance as well as genuine originality, this ultimate ‘dandy-style’ watch faithfully echoes the original with a 40 mm-diameter cushion-shaped case crafted in 18-carat pink gold and distinguished by diagonal time read-off and a crown positioned at 1 o’clock. The sandblasted dial is graced with 12 painted black Arabic numerals arranged around an equally black-painted railway track minute circle. The hands are in black oxidised 18-carat gold. Topped by a slightly convex sapphire crystal, the case is fitted with a transparent back enabling one to admire the exceptional finishing of the mechanical manual-winding Calibre 4400, developed and crafted in-house by Vacheron Constantin and bearing the prestigious Hallmark of Geneva. Beating at a frequency of 28,800 vibrations per hour, it measures 28 mm in diameter, 2.8 mm thick, and is endowed with an approximately 65-hour power reserve. This new model is water-resistant to pressures of 3 bar – equivalent to 30 metres – and is teamed with a hand-sewn saddle-stitched strap in dark brown alligator leather fitted with an 18-carat pink gold pin buckle shaped like a half Maltese Cross. Produced in limited quantities, the ‘Historiques American 1921’ is bound to delight connoisseurs and devotees of classic and daring fine watchmaking who are looking for distinctive timepieces and whose horological curiosity naturally draws them to its timeless aesthetic and functional qualities. Vacheron Constantin timepiece owned by Marlon Brando will be auctioned by Antiquorum. New York, NY – 24th septembre, 2009 – For more than 250 years, the favorite timepiece of discerning royalty and celebrities alike has been Vacheron Constantin, as an object of stature, superiority, and pure elegance. In 1954, renowned actress Zsa Zsa Gabor chose a Vacheron Constantin timepiece as a special gift for actor Marlon Brando to commemorate the release of “On the Waterfront” for which Brando won an Oscar. 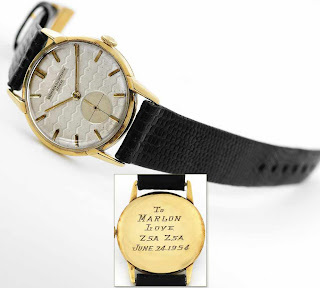 Its case back engraved “To Marlon Love Zsa Zsa June 24, 1954,” the timepiece sold at The Important Collectors’ Wristwatches, Pocket Watches & Clocks auction held by Antiquorum on September 17th in New York for six times its estimated value. 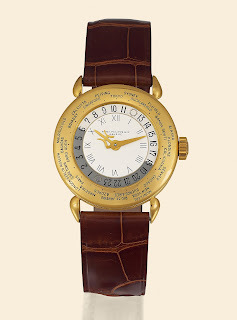 The 18K yellow gold wristwatch sold for a final price of $18,000 to an unknown buyer. Vacheron Constantin timepieces are hand-crafted works of mechanical wizardry that can take months – even years – to realize. With excellence evident in every aspect of these timepieces’ aesthetic design, Vacheron Constantin has distinguished itself as the timepiece of discerning distinction adored by today’s Hollywood royalty. As the world’s oldest watch manufacture, Vacheron Constantin and its timepieces have proven to be among the most sought-after items on the market, both as genuine masterpieces of horology and as value-generating investments. Alexander I Karagjordgevic of the Royal House of Karagjordgevic, was the first king of the Kingdom of Yugoslavia (1929 – 1934) as well as the last king of the Kingdom of Serbs, Croats and Slovenes (1921–29). Alexander was born in Cetinje in Montenegro in December 1988 as the second son of Prince Pietro Karagjordgevic , the later to become King Peter I of Serbia and also of Zorka of Montenegro. Even though he was not the first in line for the throne, his elder brother, Crown Prince George, was considered unstable by most political forces in Serbia and after two notable scandals (one of which occurred in 1909 when he kicked his servant, who consequently died), Prince George was forced to renounce his claim to the throne. So, Alexander, became heir to the throne in 1909. On 8 June 1922, he married to Princess Mary of Romania, the daughter of King Ferdinand of Romania. Vacheron & Constantin, Genève, No. 412770, case No 256398. Made in 1931. Three members of his family died on a Tuesday, so Alexander refused to undertake any public functions on that day, But, on Tuesday 9 October 1934 having no choice while arriving in Marseille for a state visit to the Third French Republic, together with the French Foreign Minister Louis Barthou, a man in the crowd shot the King, the Minister and the chauffeur. This was the first assassination captured on film. 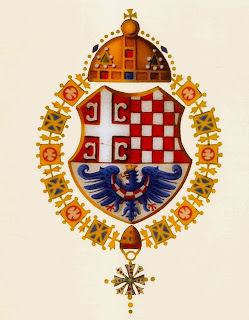 After Alexander’s assassination, as his son Peter II was still a minor, Peter’s uncle Pavle Karagjoordgevic took the regency of the Kingdom of Yugoslavia until Peter reached adulthood. Peter was to become the last King of Yugoslavia, fleeing to London in 1941 when the Nazis attacked and occupied his country. 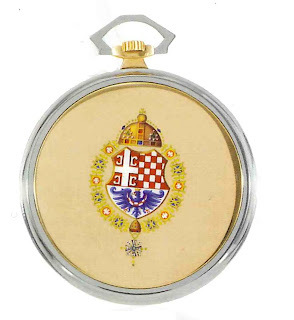 18K white and yellow gold jump hour, wandering minute keyless Art Deco presentation dress watch with enamel coat of arms for Alexander I Karagjordgevic. Vacheron Constantin makes its first-ever introduction of a watch made from tantalum. 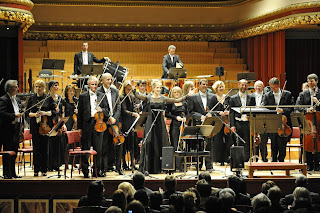 will be presented at the charity auction to be held in Monaco on September 24th 2009. In a fascinating new sequel to the official launch of the new Quai de l’Ile collection in Geneva at the April 2008 Salon International de la Haute Horlogerie, Vacheron Constantin now presents the first-ever one-of-a-kind Quai de l’Ile model. Dedicated to the ONLY WATCH 2009 charity auction that will take place in Monaco on September 24th, this unique watch features a tantalum case also representing a major first in the history of the Geneva-based manufacturer. Clasp: palladium triple-blade folding clasp with polished half Maltese cross. Five different finishes for an ultra-sophisticated new dial: the Manufacture Vacheron Constantin once again demonstrates its superlative mastery of the watchmaking art with its new Malte Moon Phase and Power-Reserve model. The Malte Moon Phase and Power-Reserve is available with a case in 18-carat white gold or 5N pink gold. The satin-brushed case-back is secured by screws. 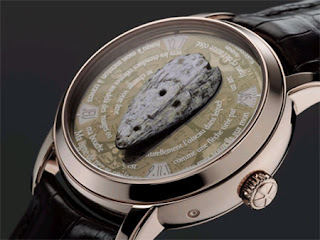 The dial is protected by a glareproofed cambered sapphire crystal. Naturally guaranteed water-resistant to a depth of 30 metres, this timepiece is fitted with a square-scale alligator-leather strap in black for the white gold model and chestnut brown for the rose gold model – both equipped with a gold folding clasp matching the case colour. 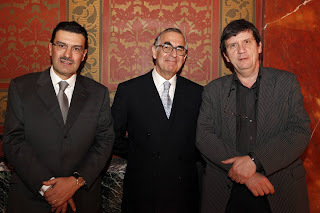 Two things convinced Jean Paul Barbier-Mueller of the project’s, its beauty and significance as he and the Vacheron Constantin team headed by Juan-Carlos Torres were able to share their common passion for beautiful objects and also the manufacture’s philosophy. Twelve masks were selected from the Barbier-Mueller collection for small-scale reproduction in gold. They repose at the centre of each timepiece in a collection that extends over two thousand years and also four continents. As Vacheron Constantin understands perfectly well the value of time, the company respected patiently the time needed to create such exceptional pieces. They took plenty of time for questioning, reflection and invention so as to assure themselves that the spirit of this special tribute to ancient societies. A complete set of the twelve timepieces reproducing the twelve masks – from the limited edition of 300 exceptional timepieces – is currently on display at the Metropolitan Museum of Art in New York, an exhibition sponsored by Vacheron Constantin and called “A Legacy of Collecting: African and Oceanic Art from the Barbier-Mueller Museum, Geneva” in tribute to Jean Paul Barbier-Mueller. 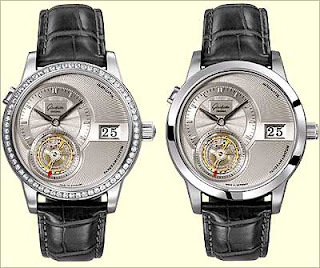 According to these unique timepieces, each wristwatch is equipped with an automatic Calibre 2460G4 movement, manufactured by Poinçon de Genève, through which time can be read without any hands (by means of a set of wheels and gears, four discs indicate the hours, minutes, day and date in windows) leaving in the centre of the dial the masks as the central attraction remaining as sculptures, as silent guardians of ancestral secrets. Michel Butor’s was the one who gave voice to the masks through magnificent short poems in prose dedicated to each mask. The writer’s lines rise as mysterious messages that can only be read when the light strikes it from a certain angle. This effect was achieved by vacuum metallization, a sophisticated technological process in which the gold letters are sprayed onto a sapphire crystal. Antiquorum announced in Geneva, last June 10th, its upcoming event: the “Important Collector’s Wristwatches, Pocket Watches and Clocks” sale prepared to be celebrated on June 27th, 2009 at the Mandarin Oriental in Hong Kong. The auction will feature 479 lots and will bring together a remarkable selection of the finest timepieces by world-renowned watchmakers. Ref. 3974, a 18K yellow gold minute-repeating gentleman’s wristwatch with black dial, perpetual calendar, leap year indications and moon phases, estimated between 2,000,000 and 2,700,000 HKD (300,000 and 400,000 Sfr). Ref. 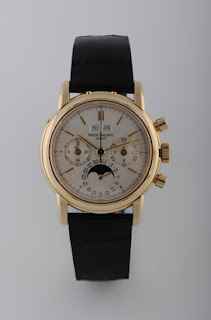 3450, an 18K yellow gold wristwatch, made in 1982, with perpetual calendar, moon phases and a red dot for the leap year indication, estimated between 1,350,000 and 1,700,000 HKD (200,000 and 250,000 Sfr). Tourbillon with 7-Day Power-Reserve Maximilian Busser & Friends, “Horological Machine No.1”, Ref. 10.TR41. Made in a limited number, circa 2006. Extremely fine and innovative, oversized, self-winding and manual, water-resistant, 18K pink gold wristwatch in the form of an eight, with four mainspring barrels providing 7-day power-reserve and visible one-minute tourbillon regulator. Caliber 97, Grande et Petite Sonnerie Minute-Repeater, Perpetual Calendar Franck Muller, Geneve, “Grande et Petite Sonnerie, Minute-Repeater – Perpetual Calendar.” Made in 1997. 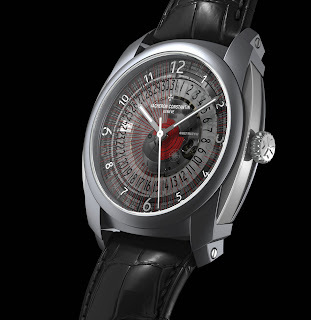 Unique, fine and rare, astronomic, grande et petite sonnerie minute-repeating, platinum and diamond-set wristwatch with retrograde perpetual calendar, equation of time, moon phases and 24 hour display. Diamond & Sapphire Rocaille Piaget, Ref. 3259. Made in the 1960’s. Extremely fine, rare and elegant, 18K yellow gold, diamond and sapphire-set lady’s bracelet watch with an integral 18K yellow gold, diamond. Platinum, Sapphires and Diamonds Vacheron & Constantin, movement. Made in 1923. Very fine and rare, sapphire and diamond-set platinum lady’s wristwatch. Mirror Image Pair – Farewell to the Beloved Swiss, Geneva. Made for the Chinese market circa 1830, and attributed to the Frères Oltramare. Extremely fine and very rare, mirror-image pair of 18K gold and painted on enamel, pearl-set center seconds, musical, quarterrepeating pocket watches playing music on the hour or at will. Antiquorum Auctioneers (Hong Kong) Ltd. Session 1: lots 1 – 110, at 11 a.m. Session 2: lots 111 – 479, at 2 p.m.
On May 20, 2009, the Korean market officially launched Quai de l’ile collection in Cine de Chef. The collection was launched through a selective press conference and launcheon in which guests were specially attended during a gala dinner where the Quai de l’ile was introduced as a symbol of the ultimate luxury. 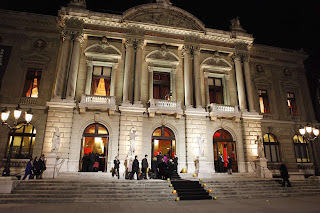 Hosts were welcomed in the main hall where they could encounter Quai de I’ile watches for the first time. They were next guided to the theatre right next door moved by the mystic dial and dynamic design of the Quai de I’ile collection. Mr, Yann Bouilonnec, Asia Pacific managing director made a speech to announce the launching of this new collection in Korea market and then all the guests could go through the revolutionary technology. The stunning animation, the understanding of the respected values, the personalization and security made, from the Quai de l’ile collection laucheon, a very fine one in which guests were specially attended. During dinner glamorous and dazzling models showed the watches walking around tables and letting the guests appreciate the close look of the timepieces being able to try them on as well as configuring their own personalized watches by the simulating programs in the tablet PC. 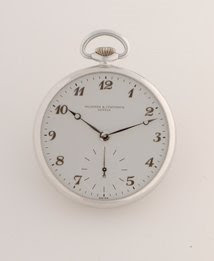 Patrizzi & Co New York: Important Pocket Watches, Vintage and Modern Wristwatches on June 4, 2009. 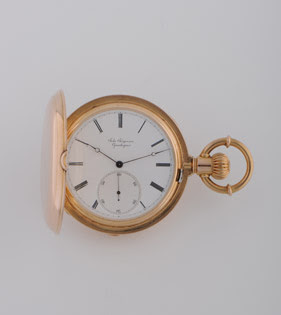 Two sessions offer outstanding pocket watches, vintage and modern wristwatch, with NO buyer’s commission and simultaneos Internet bidding. 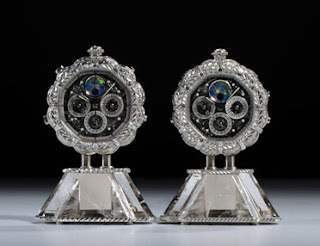 On June 4 in New York, Patrizzi & Co Auctioneers will present “Important Pocket Watches, Vintage and Modern Wristwatches” comprised of some 290 timepieces of outstanding quality, provenance and rarity. The auction follows two highly successful Patrizzi & Co auctions in Europe — the Davide Blei Vintage Rolex Collection, which was held March 22 in Milan and totaled more than $3.7 million with 114 timepieces, and the April 19 auction in Geneva with sales totaling over $6.7 million with 80% of the 263 lots sold. Patrizzi & Co was founded last year by Osvaldo Patrizzi with the purpose of bringing transparency at an auction. He also achieved fully integrating online communications with the traditional auction format and, most importantly for Patrizzi & Co’s clients, eliminated fees and simplified the auction process. NO buyer’s commission: This represents the saving to buyers of between 20–25% of the hammer price, which most other major auction houses currently charge. Five-year guarantee of authenticity: This guarantee eliminates what is often perceived to be the “risk factor” in buying important pieces via the Internet and includes an accurate and very detailed description of the quality of the piece(s) being purchased. A choice of catalogs: Clients have a choice of purchasing a special commemorative catalog or a digitally printed color catalog or downloading their own personalized version of the online catalog onto their personal computer or new generation e-Book. January 8, 2009, Hong Kong- Vacheron Constantin hosted an exclusive gala dinner at the Ballroom of the Four Seasons Hotel to celebrate the launch of the Quai de l’Ile collection, a unique dimension in the world of Haute Horlogerie. In attendance were more than 250 watch enthusiasts and watch journalists from the region, who were invited to share in Vacheron Constantin’s genuine passion in watch-making and experience the innovative personalization service that extends the boundaries in timepiece excellence and exclusivity. Prior to the gala dinner, guests were attracted by the triptyches in the foyer, a special touch screen device that enables the guests to experience in essence the ultimate luxury provided by the personalisation service of the new collection. With the Quai de l’Ile line and its revolutionary case comprising seven main parts, clients can choose from three metals, three dials and two movement finishings to create timepieces that best represent who they are, in an infinite number of possible combinations. Stepping into the Ballroom, guests were immersed into a trendy, urban atmosphere that was designed and furnished especially to match the contemporary metropolitan themed Quai de I’lle Collection. Vacheron Constantin created one of the largest indoor video systems seen in Hong Kong for the launch of the new range of models, turning the room into an urban environment that allowed the audiences to travel around the world of Vacheron Constantin and learn more about the diverse experiences depicted by the new collection. The themes of urban, contemporary, stylish, high-tech, security and personalization were woven into a tapestry of moving images to create a conceptual detailed world for the guests to indulge themselves in. Vacheron Constantin created a large scale innovative content to install a state-of-the-art high resolution video system using 12 high quality video projectors for the images to be displayed through, giving everyone in the room a 270o view of animation, which surrounded the guests in a beautiful ambience. 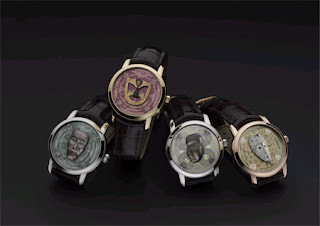 As the night evolved, the images moved from creative interpretations of Vacheron Constantin to the watches themselves. Sometimes abstract modern art, sometimes real, the images provided a constant, rich visual feast. A moment is taken to celebrate the launch of the new Quai de l’Ile range intended to wow the audience as images appear from within a 3D world demonstrating the innovation of the extraordinary watches of Vacheron Constantin. As the night progressed, the last video of a spectacular night scene brought the audience to the finale. The multilayered design of the new collection is reflected in the elegant long dining tables, where the detailed graphics of the face and bezel of the watch are printed directly onto several sheets of glass that in turn are stacked to achieve a multilayered effect, mirroring that of the actual timepiece glass. This treatment spectacled the new models in extreme close-up so that the detailing of the various faces and bezel options are showcased in a larger than life fashion, whilst retaining the spirit of the multilayered nature of the piece. This resolutely contemporary watch offers customers the opportunity to create their own personalized watch by choosing its components from a large selection of options. With the most advanced technology, customers can easily compose and order their own personalized Quai de l’Ile models at designated Vacheron Constantin retail locations worldwide. First, the personalized watch is envisaged and designed by the future buyer with the aid of an interactive tactile screen developed by Vacheron Constantin and a set of material and colour samples. It then enters its production cycle in Geneva and will be delivered within a few weeks, as agreed on beforehand with the client. 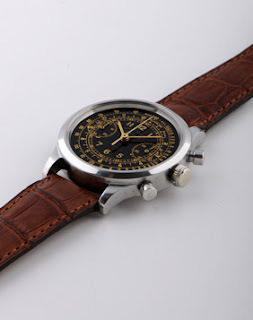 Even though collecting watches is one of the most expensive hobbies worldwide, it can also take us to many antique timepieces and also to modern innovations giving to the activity or to the search of unique models one of the most satisfying rewarding. The are a wide range of prices when speaking about watches. The top 10 most expensive watchmakers companies around the world are: Vacheron Constantin, Blancpain, Audemars Piguet, Girard-Perregaux, ChronoSwiss, Chopard, Jaeger-LeCoultre, International Watch Company (IWC), Omega and Breguet. 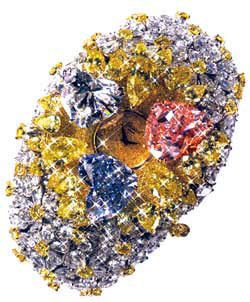 This unique timepiece is ornamented with three local point heart-shaped diamonds (a fifteen carat pink diamond, a twelve carat blue diamond and an eleven carat white diamond) in addition to the 163 carats of white and yellow diamonds, brings a total of 201 carats. 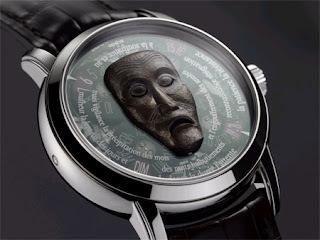 The Supercomplication watch it is said to have been produced by James Ward Packard in order to commission a watch containing the most complications worldwide. Even though Henry Graves Jr, the banker for whom the watch was produced in 1932, won the contest, the watch wasn’t beaten till fifty years later when Patek Phillipe came up with the 33 complications watch, the 18 carat gold Caliber 89. 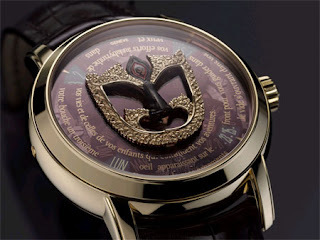 The price of this timepiece is 6 million dollars. This Patek Phillipe’s Platinum World Time is believed to be an only one time creation and when produced, the most expensive watch at the moment. After over 10.000 hours of research in order to create the Tour de I’lle Vacheron Constantine’s watch, the brand came up with the world’s most complicated wristwatch. 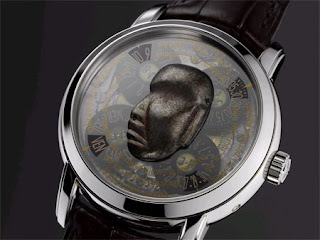 This wristwatch was produced in a limited edition of seven only one of its kind watches that combine horological complications with astronomical indications . Topped with some extremely rare black diamonds, 531 widely distributed black diamonds. Most of them are square cut not less than 322 stones on the case, 179 on the bezel and 30 at the end of the strap, on the clasp. 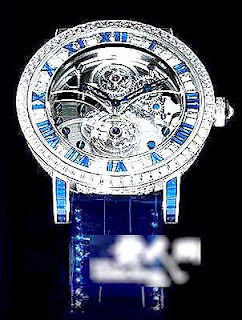 Not just the diamonds make of this watch a very exclusive one, but also, the complications and the design. 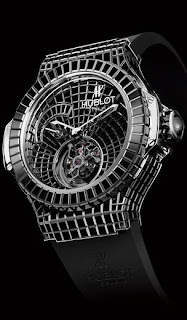 Hublot together with a diamond-setting workshop (Bunter SA) designed and developed an inimitable watch called Big Bang. It features an invisible setting were the only things that can be seen are the diamonds. 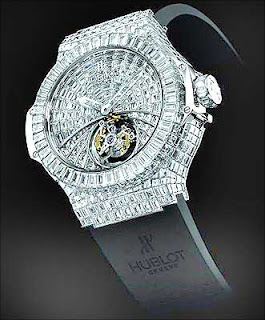 The sparkling wristwatch features 850 diamonds and also has a stunning carcass dial with hour and minute hands. The watch has a 90-hour power reserve and a Caliber CO-372 by Corum and La Joux-Perret. Only 10 pieces are in production. 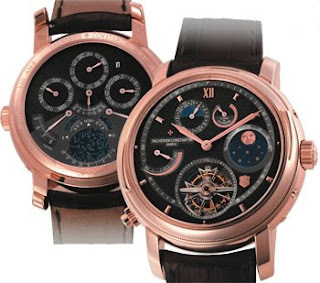 – Tecnica Skeleton Chronograph: an 850,000 Dollars Parmigiani Fleurier’s Wristwatch. It features: platinum case, minute repeater, tourbillon and chronograph, as well as a cathedral chime, between many other attractions like the diamonds it features and its amazing design. 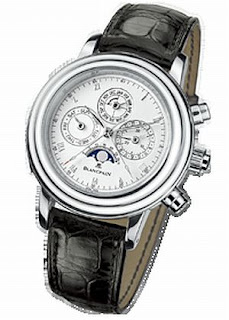 – Grande Complication Blancpain’s 785.000 Dollars Wristwatch. This wristwatch features a minute repeater, split-seconds chronograph, tourbillon, perpetual calendar, moon phase, an automatic winding mechanism, a sleek crocodile wristband. It is said to take the maker from 8 to 10 months to put together all the 740 components and that only 18 of that brilliant limited edition run of 30 watches have been assembled till now.